For me, trimming my trees has always involved getting on a pretty large ladder and climbing around a bit to get to all the important parts. However, I have fallen a few times, and I’m getting old, so I can’t risk it anymore. Because of that, a few years ago I started using pole saws, and I was really surprised by how trimming the branches became easier. If you were like me, climbing trees to cut them, you might want to consider investing in a pole saw to help you stay safer and make the job easier. I’ll try and give you the information needed to get the best pole saw you can get. What is a Pole Saw ? What to look for when buying a pole saw ? It’s a saw on a pole. Simple enough, right? Well, it’s a little bit more than just that, but that is the gist of it. It’s a small saw or a chainsaw on the end of a long, often adjustable pole used for cutting higher tree branches without the need to climb a ladder or the tree itself. That way you don’t have to endanger yourself while getting the job done. The advantage there is obvious, but depending on the type of pole saw you’re using, there might be more to it. There are more than a few variations of the pole saw, but here I’ll cover some of the more widely used ones, along with their benefits and detriments. This type of pole saw is most often used by professional gardeners or public workers. There are a few reasons for that. For starters, it can work for hours on end without needing a cord or any heavy maintenance – only a gas refill. It also has the most power out of any pole saw type, being able to cut thicker branches without issues. However, their downside is the price – not only is the pole saw itself expensive, but it also guzzles a lot of gas. Moreover, they are also not delicate enough for cutting smaller branches and are incredibly noisy, so using them in your yard will disturb the neighbors. Now, this type is the solution to the problem electric pole saws have. It still runs on electricity but uses a battery instead of a cord, usually either ni-cad or lithium-ion. They are very portable and light, don’t cost much more than the average electric pole saw, and are just as quiet. The problem is that they are significantly less powerful, usually having shorter blades, and can only run for a limited time before the battery needs to be recharged. The manual pole saw can work as long as you and your hands can manage. It’s also the most portable and lightweight, compared to other types. Because of that, they usually have the longest poles so you can reach high branches with them. Of course, because they require no power they are also really cheap. The downside is that you have to do it, well, manually. It’s extremely tiring and slow, and you cannot cut any thicker branches with it. When you’re buying pole saws you can’t try them out first, so you have to know what you want going in. Here are a few aspects that might help you make your choice. The bar of a pole saw is the ‘blade’ on which the chain is mounted. Why is this important? Well, the longer the bar is, the bigger the effective cutting area and the thicker the branches that the pole saw can cut. The extension pole is what makes the pole saw the useful tool that it is. Thus, when buying one, you have to consider how long it is as well as how adjustable it is. How long it as at both the minimum and maximum extension – both are important. If the pole saw is too long, even at minimal extension, you might not be able to cut lower branches, just as you can’t cut higher ones if it’s not long enough at the maximum. You should also check whether the pole can extend at all, or if it’s a fixed size one. As I just outlined, the length of a pole saw is significant. However, the reach of a pole saw is not the same thing – it does not include just the length of the pole, but adds to it the size of an average person. So carefully look at the packaging when buying, because you might accidentally buy a shorter or a longer pole saw than you intended. Finally, you should consider the size of your property, and the uses you have for a pole saw. If you just want to trim your rather small garden, you should probably get a short, manual pole saw. If you have a large property, like a ranch, with bigger trees, you might want to consider a gas powered saw as you need the strength and portability that it offers. You get the idea. The cord length is especially important when buying an electric pole saw. Depending on the size of your yard, you might want to buy an extension cord as well. If you’re still having trouble choosing, I’ll present you with some of the best pole saws that I have used to try and help you. This particular electric pole saw features a detachable, adjustable aluminum pole with a stated reach of 10 to 15 feet overhead. The chainsaw can be used separately and has an 8 amp electric motor as well as a 10-inch long bar. It’s easy to detach on the fly without any tools at all and equally easy to reattach to the pole. 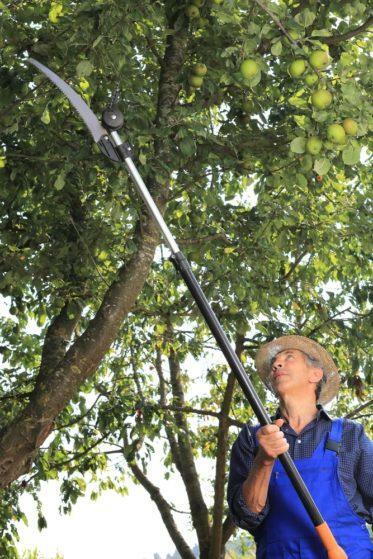 It boasts being able to cut branches of up to 9 inches in diameter. The pole and chainsaw together weigh around 11 pounds. The saw itself is fairly powerful for its size, being able to cut branches that are pretty thick. The horsepower isn’t listed on the product information but I’d assume it’s around 1.5. However, while it does have a fair amount of power, what it does not have is durability. Even when lubed with a lot of oil, the chainsaw wore out rather fast, especially the chain. Most parts of the chainsaw, aside from the motor and blade seem to be made of cheap plastic as well – which leads to things like the safety trigger and the power button failing as well. The oil reservoir also seems to be prone to leaking over time. This is another electric pole saw, featuring a telescopic pole with a reach of up to 15 feet and an extension of 8.7 feet. The chainsaw itself has a 6.5 amp motor, an 8-inch bar as well as enough power to cut branches of up to 7.5 inches of thickness. It also features automatic lubrication, which is great because I hate to oil chainsaws manually, it’s terribly messy. Together, the entire thing weighs around 8 pounds. While this one does have quite good reach and some handy functions, it fails in a few places. Firstly, it’s simply not powerful enough for branches 4 or 5 inches thick, let alone 7.5 as stated! Moreover, the chainsaw wears out really fast, and the chain itself tends to come loose leading to safety concerns. The entire thing seems to be made of some rather cheap materials. Even the pole cracked after a short while. The automatic lubrication function does not seem to work well either, as it tends to leak oil all over the blade of the chainsaw, even when it’s not overfilled. Not sure what the problem is there. This is a battery powered pole saw using a 20V lithium-Ion battery that is rechargeable, boasting a “100 cuts per charge”. It features a telescopic pole with a length of 6.5 to 10 feet and an overhead reach of 14 feet. The chainsaw itself has an 8-inch bar being able to cut branches of up to 6 inches in diameter. The whole thing weighs only 6.3 pounds, making it rather easy to use and transport. While the lithium ion battery in this one can be recharged a lot of times before it dies, it does not last long in the field. With a fully charged battery, this saw can only work for around half an hour before it shuts down. After that, you need to recharge the battery, and that lasts for a long time, usually around 4 to 5 hours. If you’re planning to do a lot of work with it – I’m afraid that’s not possible, as I found out personally. Moreover, it’s not all that powerful, so it will take you a long time to take down even 4-inch branches. Combined with the short runtime and long recharge time it just doesn’t seem like a “100 cuts per charge” is true. Here we have a pole saw powered by a 40V lithium-Ion battery, featuring an 8-inch bar with a tensioning system for easy chain tightening. The shaft is made out of three pieces and can be extended up to 8 feet. This saw also contain an automatic oiling system for easy application of oil to the chainsaw blade. The whole thing weighs around 10 pounds. While the automatic oiling system works, it works a little bit too well. Sometimes it starts putting too much oil on the blade, and it just guzzles oil at all times, needing constant refills which interrupt your work. The battery life, however, is better than in most similar products I’ve used. The battery tends to work for an hour or even a little more, and it recharges in a few hours. The chain needs constant tightening as it tends to come off otherwise and even when completely tightened it does not make clean cuts, and that’s not good for the health of the tree. That might also be the case because the entire thing is cumbersome and unwieldy, especially with how weighty the battery is. It’s also a bit too pricey. Another electric﻿﻿ chainsaw from Remington, featuring a pole with a 10 to 15 feet reach that can easily be separated from the chainsaw, in order to use the saw on its own. The chainsaw itself has an 8 amp electric motor, as well as a 10-inch bar and chain. The weight of the entire thing is around 10 to 11 pounds at most. It’s relatively similar to the other Remington product I mentioned here, with a few significant changes to the design. Namely, there is the improved trigger and a better hand guard, as well as a better pole that can now be adjusted from both ends. More importantly, it seems that the terrible leaking problem the previous model had has been fixed here. However, it still has some of the same problems. The saw is not very durable and dulls rather fast, while the trigger still has a tendency to fail after a while, and it’s still too heavy for an electric pole saw. The plastic parts are still as flimsy as ever and prone to breaking or failing. Cuts well at first, I’ll give it that, but it’s not suited for any serious work. Well, of all of these the clear winner for me is the GreenWorks 20672 G-MAX, even though it has many flaws. While none of these pole saws are actually suited for any heavy duty work, I got the most use out of this one. I haven’t been able to use it to cut some of the bigger branches, but it’s been reliable enough for cutting some medium sized ones at least, which I can’t say for the other pole saws I listed here. Overall, I’d say it’s the best one out of the ones I tried and the only one I still use regularly. Lawn Mower White Smoke Then Dies: What Are the Causes?